Jerusalem, Israel. 25th March, 2018. 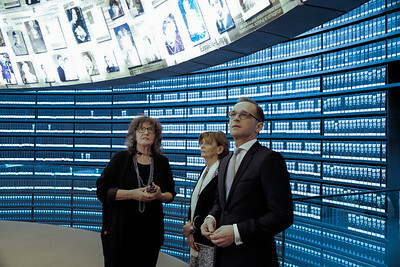 The Federal Minister for Foreign Affairs of Germany, HEIKO MAAS, gazes up at enlarged Pages of Testimony in the Hall of Names at Yad Vashem Holocaust Museum, where Pages of Testimony of more than 4,000,000 Jewish Holocaust victims are eternally preserved. Maas toured the museum, participated in a memorial ceremony, visited the Children's Memorial and signed the museum guest book. Jerusalem, Israel. 25th March, 2018. 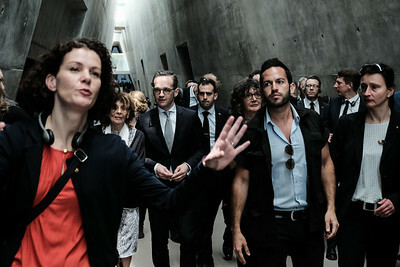 The Federal Minister for Foreign Affairs of Germany, HEIKO MAAS (C), tours the Yad Vashem Holocaust Museum. 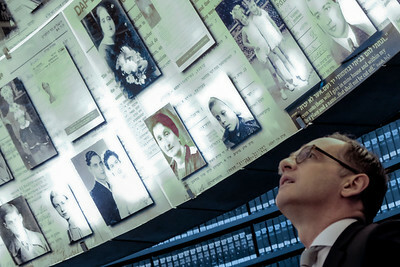 Maas toured the museum, participated in a memorial ceremony, visited the Children's Memorial and signed the museum guest book. Jerusalem, Israel. 25th March, 2018. 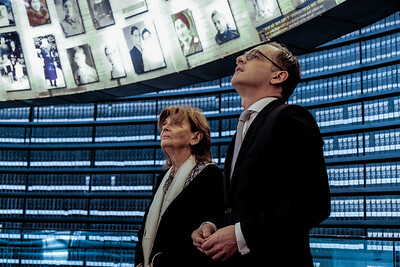 The Federal Minister for Foreign Affairs of Germany, HEIKO MAAS (R), gazes up at enlarged Pages of Testimony in the Hall of Names at Yad Vashem Holocaust Museum, where Pages of Testimony of more than 4,000,000 Jewish Holocaust victims are eternally preserved. Maas toured the museum, participated in a memorial ceremony, visited the Children's Memorial and signed the museum guest book. Jerusalem, Israel. 25th March, 2018. 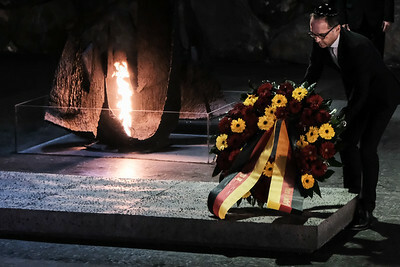 The Federal Minister for Foreign Affairs of Germany, HEIKO MAAS (L), rekindles the Eternal Flame and lays a wreath as he partakes in a memorial ceremony in the Hall of Remembrance at Yad Vashem Holocaust Museum. 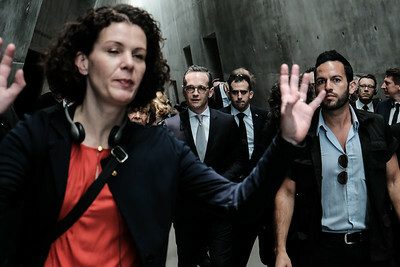 Maas toured the museum, participated in a memorial ceremony, visited the Children's Memorial and signed the museum guest book. Jerusalem, Israel. 25th March, 2018. 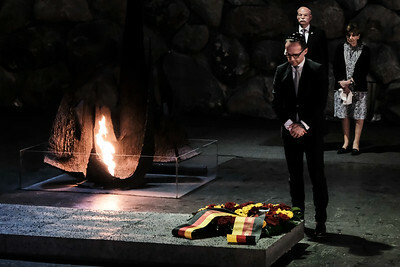 The Federal Minister for Foreign Affairs of Germany, HEIKO MAAS, rekindles the Eternal Flame and lays a wreath as he partakes in a memorial ceremony in the Hall of Remembrance at Yad Vashem Holocaust Museum. Maas toured the museum, participated in a memorial ceremony, visited the Children's Memorial and signed the museum guest book. Jerusalem, Israel. 25th March, 2018. 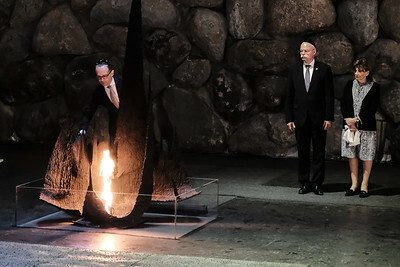 The Federal Minister for Foreign Affairs of Germany, HEIKO MAAS (front), rekindles the Eternal Flame and lays a wreath as he partakes in a memorial ceremony in the Hall of Remembrance at Yad Vashem Holocaust Museum. Maas toured the museum, participated in a memorial ceremony, visited the Children's Memorial and signed the museum guest book.